Motorola is already making lots of rumors regarding its much awaited and most discussed smartphone i.e. Motorola X. This smartphone is referred as the comeback of Motorola in the smartphone market after being in loss for few years. Google who owns the Motorola brand now seems to be working seriously. The first official teaser came out in a patriotic theme claiming that it’s the first smartphone manufactured in US and now we got news all over the internet that its launch event is going to be arranged on August 1, 2013. There is still more than a week to come the launch event date but there are already few leaks about the Motorola X. Recently Android Police leaked the first press image along with specifications of the device. Let see what all has been leaked so far i.e. 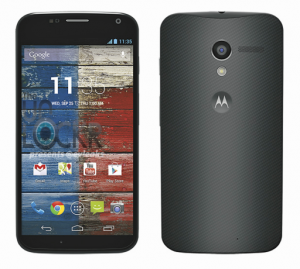 what we know so far about the Motorola X specifications. The front design of the Motorola X is going to be similar to the Nexus 4. The three capacitive touch control buttons are going to be on the display itself just like the Nexus 4 and there will be 2.1MP camera at the top. The back part is going to have Motorola logo at the centre while 10.5MP camera will be there just above that. LED flash is going to be located between them and the loudspeaker is right to the rear camera. The back body has got a new kind of look (vertical lines all over) and it looks like Motorola has used a better material in the manufacturing. Let see what actually it is when the device gets officially launched. The display is going to measure 4.7” with HD resolution of 720×1184 pixels. Again the display size is similar to Nexus 4. The X is going to be powered by a dual core processor that will be added on Qualcomm S4 Pro chipset. There will be 2GB of RAM and 16GB of on board storage. A GPU from Adreno 320 is also reported. The leaked specifications don’t have any information about the expandable storage option and I think it’s not going to be there since X looks very slim. The Moto X runs Android 4.2.2 Jelly Bean OS and it will definitely receive the next version of Jelly Bean which is also about to make ground soon. No other specifications are leaked but we can expect the LTE support for sure. Google and Motorola will also look for better battery life as always so the X may pack a battery of more than 2500mAh rating. Earlier rumors also claimed that Motorola X will allow user to customize their device according to their usage that means the device will allow hardware customization. Now we’ve no other option than to wait keeping fingers crossed till the launch event.